In Lake Charles, Louisiana during Mardi Gras, I learned what it was like to feel like royalty. Clad in a carnival mask, a feather boa, and strands upon strands of shiny beads, I looked down on my subjects and threw Mardi Gras beads to a select few. Giddy with my unexpected power, high above the crowd, I smiled at the cheering children and their parents, all jumping up and down in excitement with outstretched hands. I generously tossed shiny strands in traditional Mardi Gras colors, believed to have been chosen by Russian Grand Duke Alexei Romanov when he came as a guest of honor to New Orleans in 1872. Purple for royalty and justice, gold for purity and power, and green for friendship and faith. 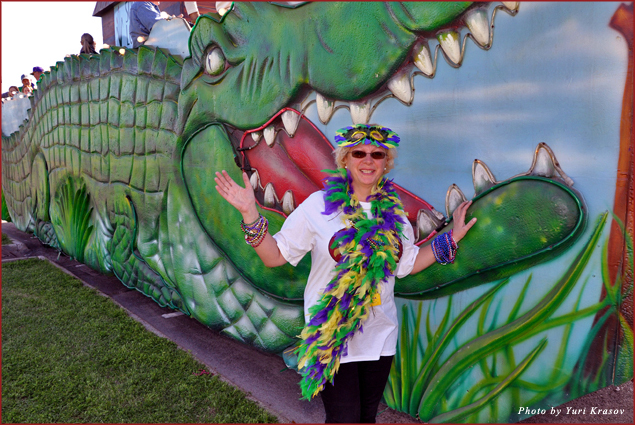 I was standing on a city float, next to its mascot, Gumbeaux Gator, riding at the Sunday Children’s Parade – one of the many celebratory happenings, like Pets Parade; Hot Rods, Motorcycles, and Classics Parade; Zydeco Music Fest, and various krewes’ costume presentations and balls. “Krewe,” pronounced “crew,” is a term that dates back to the 19th century for a group that puts on a parade and ball during carnival season. By the time I was done with my bag of beads, my right arm was so sore, I could hardly hold my bottle of locally-brewed Abita beer, but that was a great feeling! Then on Fat Tuesday, I had a chance to relive the experience from the other side, when I took my place in a cheering crowd on a sidewalk for the grandiose Krewe of Krewes’ Parade. I jumped up and down in my plastic rain poncho trying to catch the beads flying out from the festively decorated floats. 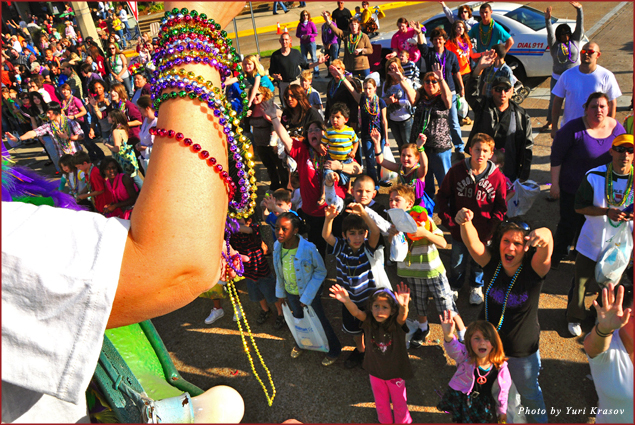 I fully grasped the catching tactic: attract attention of the most athletic bead-thrower on a float, stare him in the eye, wave and smile – and you got your beads delivered right into your palm by his precise throw. Mind your neighbor, who might be taller than you, and already overloaded with beads, but who is trying to catch the same strand as you. Pull, if necessary, and if she wins, or if the beads fall to the ground, immediately switch your attention to the next float and the next bead-thrower. What an amazing way to get high on purity, justice, and faith! Before the grand parade there was Lundi Gras, a day of the Royal Gala, when about 50 different krewes presented their lavish costumes to the public. No other city in Louisiana allows the public to view this event. 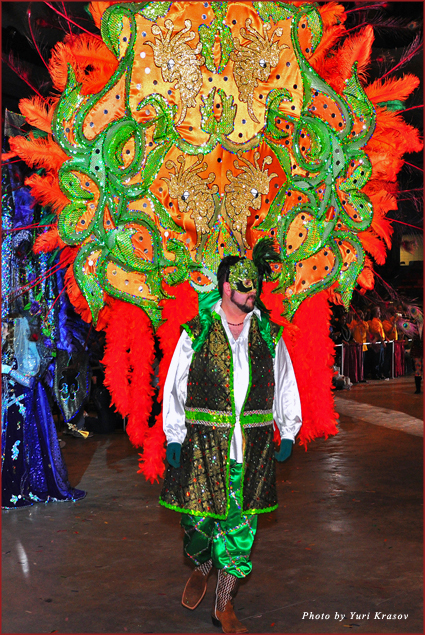 Kings and queens, dukes and duchesses, and princesses and jesters of the court strolled in plain view of the tightly-packed bleachers through the Lake Charles Civic Center arena in a mind-boggling splendor of colorful silk, brocade, gild, sequence, and ostrich feathers. 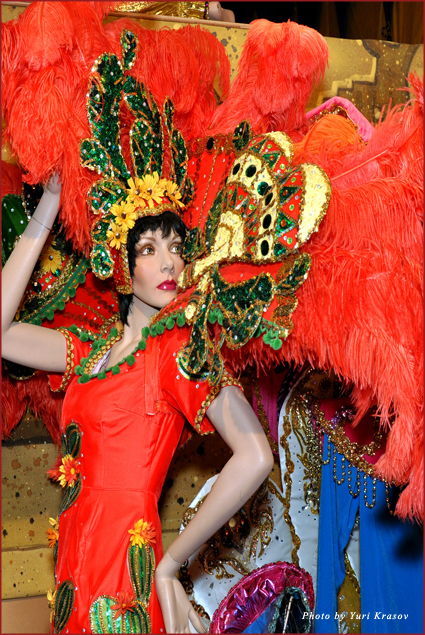 Lake Charles boasts the second-largest Mardi Gras after New Orleans and is the home of the Mardi Gras Museum of Imperial Calcasieu, which holds the largest collection of carnival costumes in the world – around 300. There, our group of traveling revelers embarked on a tour with Dolores and Bernard Beaco – a royal couple of Mardi Gras veterans, married to each other for 55 years and intimately familiar with the intricacies of the elaborate annual celebrations. Then we learned some simple techniques of King Cake decorating from Paula Stevens of Delicious Donuts & Bakery, and some easy steps of Zydeco dancing from talented and energetic teacher Harold Guillory, who also plays washboard in a Zydeco band. Later in the day, we boarded a J&R Carriage horse ride with a local historian A.C. Boudier for an excursion to the Charpentier Historic District, studded with Queen Anne and Victorian architectural gems and majestic oak trees and covered with resurrection fern. A 400-year-old Charles Sallier oak is still growing on the grounds of the Imperial Calcasieu Museum, where we walked with museum director Susan Reed through a display of historical artifacts, and through the George Rodrigue Blue Dog Days exhibit, featuring the artist’s rendition of the beginnings of Acadiana. To get closer to nature, we boarded a luxurious party bus operated by Bon Temps Express, with our knowledgeable guide, Captain Sammie, for a Pintail Wildlife Drive on the Creole Nature Trail All-American Road and a visit to the newly remodeled Cameron Prairie Visitors Center. 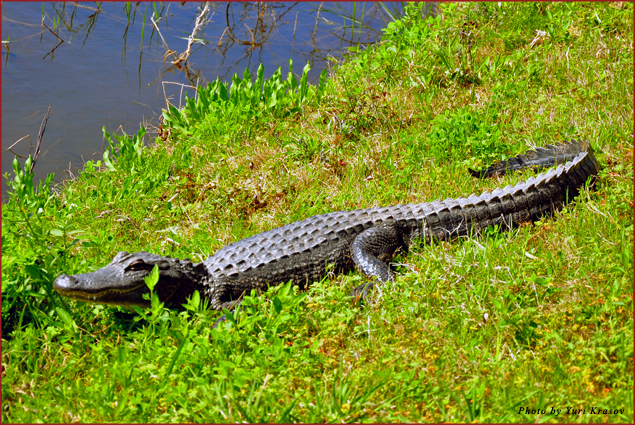 On one of our stops, trying to get a closer look at the American alligator basking in the sun on a swamp bank, I inched toward the official reptile of the state of Louisiana with a little treat of boudin sausage in my hand, but then I remembered a warning not to feed the alligators. Actually what stopped me was my previous knowledge about alligators’ eating habits – they are the only animals who cannot distinguish between a piece of feed and a hand that feeds them. Speaking of boudin sausage, there is a Southwest Louisiana Boudin Trail dedicated to the original local producers of this pork-and-rice delicacy, which can be consumed hot or cold, sautéed or grilled, for breakfast or dinner, with crawfish tails or jalapeno added – and never fails to satisfy. One of the great outlets for delicious freshly-made boudin is a locally-owned grocery store, Market Basket. Louisiana’s legendary cuisine is inspired by many sources, and Lake Charles has no shortage of great restaurants supplying traditional fare. I made a point of trying as many types of gumbo as I could. Chicken and sausage gumbo at Pujo Street Café was thick and spicy, the way this classic is supposed to be. At Steamboat Bill’s On the Lake, the gumbo was also great, but so was the seasonal crawfish etouffee, deep-fried shrimp pistolettes, and boudin balls. Not everything is deep-fried in Louisiana. 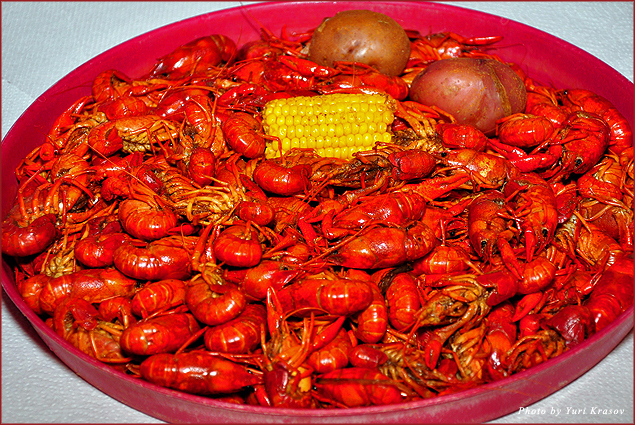 An enormous bowl of crawfish, a house specialty, was not only “boiled with pride,” but finger-licking delicious. 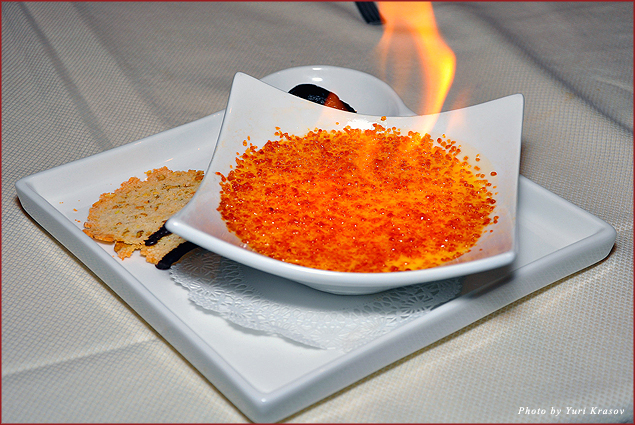 Upscale Ember Grille & Wine Bar at L’Auberge du Lac Casino Resort serves haute cuisine, like seared Hudson Valley foie gras with port reduction, black truffle goat cheese baklava, and Kobe- and grass-fed beef steaks. At 121 Artisan Bistro we enjoyed specialty cocktails with familiar names: Hemingway, Brando, Monroe, and a delightful Vodka Blueberry Fizz, as well as local brews from Lazy Magnolia – Southern Pecan nut-brown ale and sweet-potato creamy Jefferson Stout. 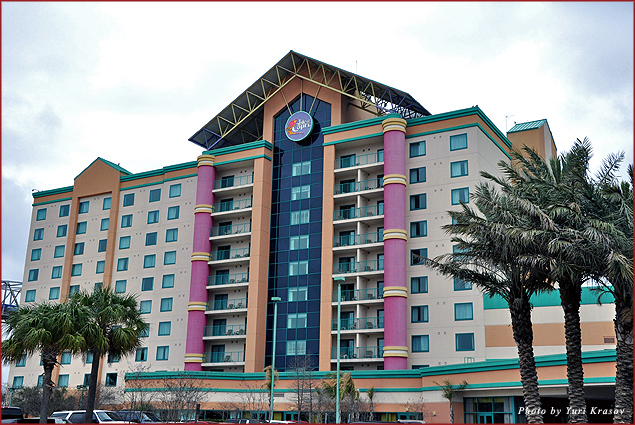 The best brunch I’ve ever had was served at our home away from home – Isle of Capri Casino Hotel, where we stayed, played, and danced to live Zydeco music every night. The recently opened Otis & Henry’s Bar and Grill serves a creative Eggs Benedict on top of artichoke hearts and crab cakes; tender pork chops, and Southern specialties. 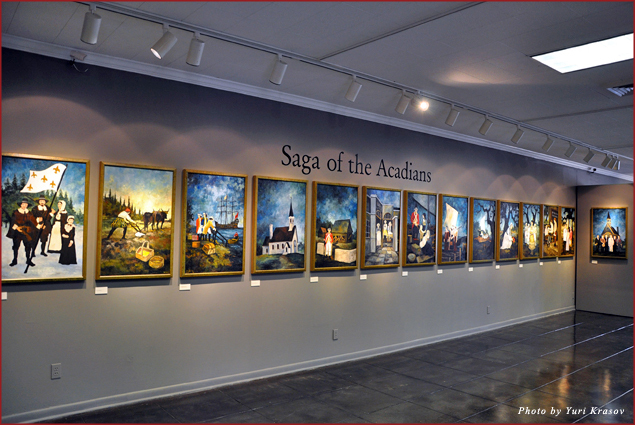 Lake Charles is a fabulous travel destination at Mardi Gras or any time. Laissez les bons temps rouler – let the good times roll.